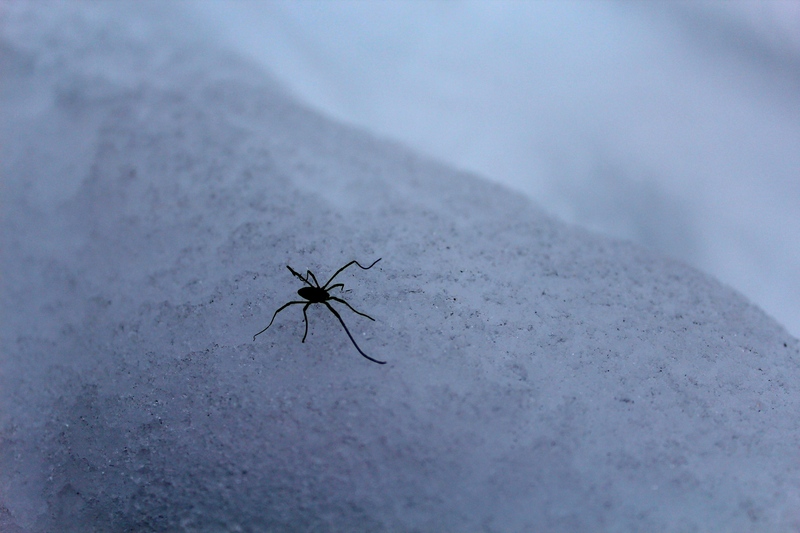 Harvestman in the snow, Randolph, NH. There are over 4,000 species of harvestman, a type of arachnid often called daddy longlegs. We spotted this individual while snow hiking around Durand Lake. He was chilling out on the crest between two cross-country ski tracks. My son nudged him a little and sure enough, he was alive and probably doing fine. We left him alone and went on our way. Any tiny black critter confident enough to hang out on a cold, white background deserves our respect. By the way, it’s a myth that these creatures have the most poisonous bite in the arthropod phylum, but have fangs that are too weak to penetrate human skin. None of the species in this group has fangs or poison. They have to pounce on their prey and pry it apart. This is unlike their soulless cousins, the spiders, who employ more cowardly methods. Like poison, webs, and lurking in my bathtub.